The 1992 NHL entry draft is not one that was either deep or especially productive. For example, there is no 500-goal scorer out of that draft, no 400-goal scorer for that matter. It claims only one 300-goal scorer, and that one – Alexei Yashin (337 goals) – is better known for the bizarre fashion in which his career unwound more than anything he did on the ice. Tucked deep in that draft was a young center from Port Jefferson, NY, who wasn’t even the first player taken from his family in that draft. Chris Ferraro, the twin brother of Peter Ferraro (taken 24th overall by the New York Rangers) was taken in the fourth round, 85th overall in that draft by the Rangers. The Sedin Twins they were not, but twins making the NHL is quite an achievement. Between them, they appeared in 166 NHL games over their respective careers, Peter in 92 of them over a six-season career that included four games with the Caps in his last NHL season, in 2001-2002. It is Chris, though, that is of interest here. It took Chris three seasons after he was drafted to reach the NHL, years he spent at the University of Maine and then with the Binghamton Rangers in the AHL for a season. He got his call-up to the show late in the 1995-1996 season and made his debut against the Florida Panthers. Although his Rangers would lose that game, 5-3, the debut would have an almost storybook quality to it. He scored a power play goal in that first game, his twin brother Peter earning the primary assist. Ferraro played one more game for the Rangers that season and 12 games the next, recording a pair of goals and three points in the 14 games overall. However, it did not look good for his becoming a more permanent fixture in the Ranger lineup, and he was waived in October 1997. The Pittsburgh Penguins claimed him, and he went on to have his career season with the Pens in 1997-1998, modest as it was, going 3-4-7, minus-2, in 46 games. It was a good enough performance for Ferraro to be signed by the Edmonton Oilers as a free agent in August of 1998. Unfortunately for Ferraro, that was the first in a series of short stops followed by signings as a free agent. After appearing in only two games with the Oilers in 1998-1999 he was signed in July 1999 by the New York Islanders. 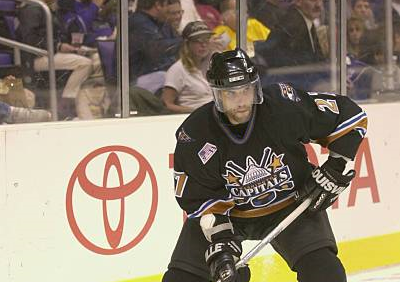 After appearing in 11 games with the Isles, he was signed in July 2000 by the New Jersey Devils, for whom he never played, spending the entire 2000-2001 season with the Albany River Rats. It would be the following summer, in August 2001, that he was traded to the Caps for, what else, “future considerations.” And then, in the space of less than two months, it would be the best of times and the worst of them for Ferraro. He was called up to the Caps in mid-October. He made his debut with the Caps on October 16th in Los Angeles against the Kings, recording an assist on an Ulf Dahlen power play goal in the second period that proved important in the Caps’ 3-2 overtime win. It would be his first game with the Caps and his last, and his only point with the club. It should have been among the happiest of times. His team debut, skating with his twin brother, who by this time was also a Capital, contributing to the win on enemy ice. It lasted as long as it took to make a phone call to his wife that went unanswered. With his wife’s illness hanging heavily over the couple, he took a leave of absence from the club. Ferraro tried a comeback of sorts, signing as a free agent with the Phoenix Coyotes in July 2003, took a turn in Europe for a couple of seasons, did the same with the Syracuse and San Antonio franchises of the AHL, and spent a season in Las Vegas in the ECHL. But Ferraro would not play in the NHL again before his pro career ended after the 2008-2009 season, his first game with the Capitals being his last.